Listen to music while riding your bike safely with this helmet! The ubiquitous computing helmet explores how design, both aesthetically and technically, can transform a bicycle helmet into a desired and fashionable aspect of riding a bicycle. With an increase in urbanization and the number of cyclist in urban environments, this design aims to reach into the future to investigate the ubiquitous computing capabilities of a helmet that will provide a safe and desired experience between the user and the helmet. 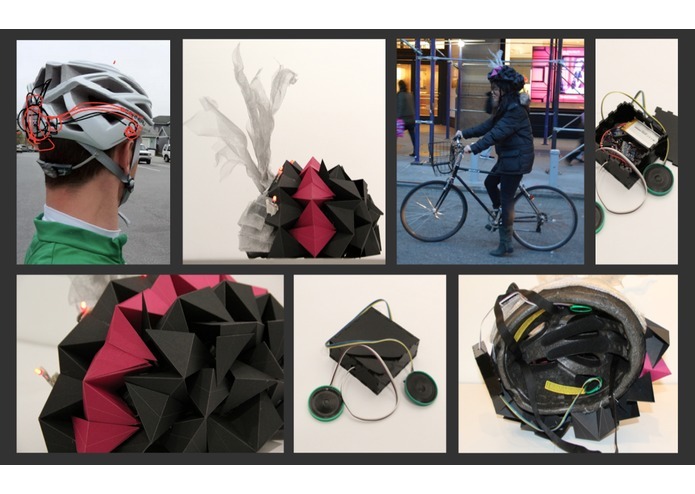 This project synthesized information regarding the aesthetics of a helmet and the design of a safe, audio emitting helmet to allow the user to hear both music and ambient noise of the city soundscape.